Story: Chen Hua (Lau Ching-Wan) is a drug-addict and a dealer. His girlfriend Carol (Jiang Yiyan) wants him to finally get clean, but Chen Hua even sends her to a dance club to earn some money. 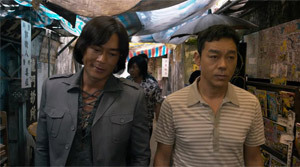 At the same time he and his friends Bullhorn (Gordon Lam) and Cat (Zhang Jin) sell some drugs on the side. This is strictly forbidden by their boss Harley (Louis Koo) and thus this results in a dispute between the boss and Bullhorn resp. Cat and eventually Chen Hua, who Harley gives the chance to flee. But first his girlfriend Carol leaves him after trying to poison his food. Ultimately, he ends up in jail for five years. When he is released he becomes addicted to drugs again, but he undergoes another withdrawal treatment and from that day on he helps others to get clean, too. The first ones are his friends and they actually find their way back into a normal life. 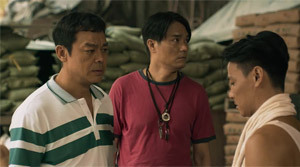 Chen Hua is recommended for an award because of his social commitment and he also works as a mediator between drug lords. The only thing left to do is to somehow rekindle his relationship with Carol. Review: Bio-pics always have one problem - they are supposed to portrait the personality of one individual during several decades and since life can be very varied this also means that adaptations of this kind often struggle with an incoherent tone. So we have to deal with that at times. Still, this is no reason to deliver a movie which message is impossible to pinpoint. The constant back and forth shifts concerning what stands in the story's centre also mean that we feel without orientation at some point. Moreover, the acting may be well achieved, but the character drawings turn out to be incredibly shallow and also prevent us from really warming to the fate of the different individuals. 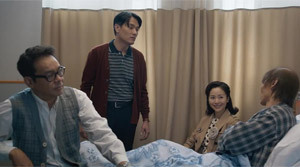 "Dealer Healer" is based on the life of Peter Chan Shun-chi, who also served as a producer here. 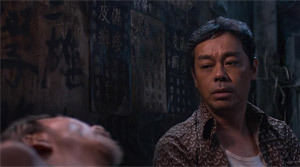 The film kicks off with a rather incoherent montage of Chen Hua's life as a dealer and drug-addict. His friends are also introduced, but even though the lives of these individuals turn out to be rather dull and scruffy indoor locations and junkie caves depict drug addiction as everything but glamorous - just as the Chinese production company would ask for - the film can turn out to be rather colorful. Reason for that being that the movie takes place in the 70s among others and thus a lot of color finds its way to the screen. Moreover, the clothes always create a convincing picture of traveling back in time. Only the wigs the actors have to wear are at times a tad too much and take away from the decent level of authenticity. Even though the first part of the movie might be the more interesting one, most of the frustration sets in here as well. What exactly does Lawrence Lau (Co-director of "My Name is Fame") actually want to achieve? What is his work aiming at? The screenplay is overloaded and follows too many story threads at once without ever really taking care of one of them. This particularly concerns Chen Hua's girlfriend, excellently played by Jiang Yiyan ("Sword Master"), who often enough steals the show of others. The relationship between her and the protagonist alone would have provided enough material for the whole movie. Then, there is also the relationship between the three friends, which remains pretty generic until we realize towards the end that there actually has been a bit more between them than just goofing around. It's also a shame that Gordon Lam ("Firestorm") and Zhang Jin ("SPL 2") haven't been made use of the way their talents would have demanded it. Towards the end the movie turns into a drama and when the three are sharing the same screen some kind of chemistry starts to unfold which should have been the groundwork for the whole movie. That's where the picture manages to become surprisingly touching. The relationship between the drug lord, also convincingly portrayed by Louis Koo ("Wild City"), would have deserved more space, too, since it seems quite appealing. Chen Hua's mediator role between several drug lords could have been put to better use as well. But that's already at a point where the movie has made clear that it doesn't want to dive deep into any of its themes. The second half, in which Chen Hua's phase of redemption stands in the limelight, isn't that thrilling anymore either. Only towards the end the drama succeeds in being convincing and it also shows how much more "Dealer Healer" could have been. The actors are desperately trying to make up for the shallow written characters, but even if they succeed at times it doesn't add up to a good movie. Furthermore, the movie's tone is unsteady. Sometimes the flick doesn't take itself too serious, then again the drama hits you with full force, and at other times one of the characters dies rather unceremoniously. As already stated this makes you quite frustrated and desoriented at times. What message does Lawrence Lau want to convey in the end? He never answers this question. Apart from that he missed simplifying the story a bit more and shifting the focus on only a few aspects. This would have been the right thing to do with a running time of 100 minutes because as things are the movie proves to be quite a shallow affair.